در این تحقیق پویایی درآمد سرانه ایران با استفاده از داده‌های GDP سرانه واقعی - داده‌های تاریخی مدیسون (2010) - و آزمون پایایی کرین - ای - سیلوستره و همکاران (2005) طی دوره 1329-1387 مورد بررسی قرار گرفت. نتایج تحقیق نشان می‌دهند، اقتصاد ایران طی دوره 1334 تا اواسط دهه 1350 دوران طلایی را تجربه نمود و اگر این روند ادامه می‌یافت اکنون می‌توانست در باشگاه کشورهای با درآمد سرانه بالا قرار گیرد اما به خاطر سیاست‌های اقتصادی اجرا شده بعد از شوک نفتی اول، تحولات سیاسی - اجتماعی دهه 1350، جنگ تحمیلی هشت ساله عراق علیه ایران و تحریم‌های اقتصادی، سطح درآمد سرانه ایران آن چنان کاهش یافت که با فرض تداوم رشد اقتصادی دهه 1380 (یعنی متوسط رشد سالیانه 4 درصد)، درآمد سرانه حدوداً نوزده سال با سطح پیش‌بینی شده بر اساس دوران طلایی فاصله دارد.
. در این مقاله، اواسط دهه 1330 تا اواسط دهه 1350 را دوران طلایی نامیدیم. In this paper, we analysis the dynamics of per capita income by using Carrion –i- Silvestre et al. (2005) stationary test over the period 1950-2008. We use the Madison historical data. The Results show that Iran economy experienced a golden period over 1955-1976, and if this trend had been continued, Iran could be in high per capita income club countries. 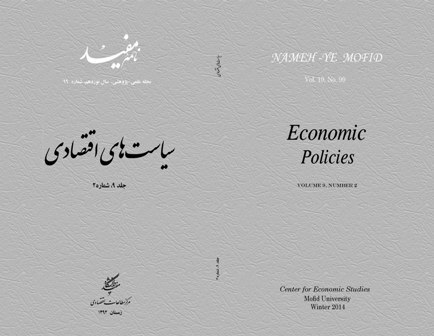 Because of economic policies after first oil shock, political – social changes in the1970s, the 1980-88 war with Iraq, economic sanctions and the oil price collapse in the year 1986, the GDP per Capita in Iran has fallen so much that if the Iranian economy were growing at an average rate of 4 % a year (economic growth in the 2000s), there would be a gap of 19 years between GDP per capita in 2008 and its forecast for this year. رنجبر، امید؛ علمی، زهرا (میلا)؛ «تحلیل شکل‌گیری همگرایی اقتصادی در منطقه خاورمیانه و شمال آفریقا: یافته‌های جدید»، 1387، نامه مفید، شماره 66. Aghion, Philippe and Peter Howitt; 1992, "A Model of Growth through Creative Destruction", Econometrica, 60 (2), 323-351. Ben-David, Dan and David H. Papell; 1995,"The Great Wars, the Great Crash, and Steady-State Growth: Some New Evidence about an Old Stylized Fact", Journal of Monetary Economics, December, 453-475. Ben-David, Dan and David H. Papell; 2000, "Some Evidence on the Continuity of the Growth Process Among the G7 Countries", Economic Inquiry, 38, 320-330. Ben-David, Dan, Robin L. Lumsdaine and David H. Papell; 2003, "Unit Roots, Post-War Slowdowns and long-Run Growth: Evidence from Two Structural Breaks", Empirical Economics, 28(2), 303-319. Cheong YW and Pascual AG; 2004, "Testing for output convergence: a re-examination", Oxford Economic Papers 56, 45-63. Grossman, Richard and Elhanan Helpman; 1991, "Quality Ladders in the Theory of Growth", Review of Economic Studies, 58, 43-61. Jones, Charles I; 1995b, "Time Series Tests of Endogenous Growth Models", Quarterly Journal of Economics, 110 (441), 495-525. Jones, Charles I; 1999, "Growth: With or Without Scale Effects? ", American Economic Association Papers and Proceedings, 89, 139-144. Jones, Charles I; 2001, "Was an Industrial Revolution Inevitable? Economic Growth Over the Very Long Run", Advances in Macroeconomics, August 2001, Vol. 1, No. 2. Jones, Charles I; 2002, "Sources of U.S. Economic Growth in a World of Ideas", American Economic Review, 92 (1), 220-239. Jones, Charles I; 2003, Population and Ideas: A Theory of Endogenous Growth, in P. Aghion, R. Frydman, J. Stiglitz, and M. Woodford, eds., Knowledge, Information, an Expectations in Modern Macroeconomics: In Honor of Edmund S. Phelps, Princeton University Press. Jones, Charles I; 2005, "Growth and Ideas", in P. Aghion and S. Durlauf, eds., Handbook of Economic Growth, Elsevier, Volume 1B, 1063-1101. Papell, David H. and Prodan, Ruxandra; 2009, "Time Series Tests of Constant Steady-State Growth", University of Houston, Working paper. Rebelo, Sergio; 1991, "Long-Run Policy Analysis and Long-Run Growth", Journal of Political Economy, 99, 500-521. Romer Paul; 1992, "Two Strategies for Economic Development: Using Ideas and Producing Ideas", Proceedings of the World Bank Annual Conference on Development Economics, 63-115. __________ ; 1990, "Endogenous Technological Change", Journal of Political Economy, 98 (5), 71-102. __________ ; 1986, "Increasing Returns and Long-Run Growth", Journal of Political Economy, 94, 1002-1037. Romer David; 2004, Advanced Macroeconomics, 3rd Edition, McGraw-Hill, New York. Solow, Robert M; 1956, "A Contribution to the Theory of Economic Growth", Quarterly Journal of Economics, 70 (1), 65-94. Zivot, Eric, and Donald Andrews; 1992, "Further Evidence on the Great Crash, the Oil Price Shock and the Unit Root Hypothesis", Journal of Business and Economic Statistics, 3, 251-70.